How your culture, use of social media and the crisis itself influences whether you should use social media to respond. This blog post was produced for Hospice UK following the HUK Comms Day in July. It is intended for hospices and healthcare providers but is relevant to others too. What does your crisis comms plan say about how you’ll use social media? Does your social media policy or strategy (if you have one) include detail about how to respond to an emergency or high-profile story? Do you have the skills and processes in place so you could hit the ground running if you needed to? Charities have consistently been in the headlines this year. Some cases such as Oxfam, GOSH and Alder Hey were front page news for weeks. Charities such as RNLI and Dogs Trust had to set the records straight when journalists mis-reported stories about their work. We live in a time where people can voice their opinions loudly. In crisis situations (which can be bad or good), social media can be well used to promote your side of the story, to connect with supporters and to even turn a story around. But to get it right, you need to fully assess the situation to work out how to respond. What you do depends on having a culture and framework where social media is a well-oiled comms tool. Deciding what to do depends on the crisis and your approach to social media. a crisis in the local area – as community-based organisations, should you join in with local issues? If a local crisis hits (such as a big accident, fire, local celebrity scandal) do you have capacity or the inclination to connect with local people or show solidarity? social media ‘crisis’ – this means something which is primarily on social media. This could be something you have started yourself which has ‘gone viral’ or a hashtag you need to join in with, or a patient documenting their illness which includes the care you are giving them. How you respond depends on the situation. And the culture and community you have created around your comms. Does your organisation primarily use social media to broadcast? This means that your Twitter or Facebook feeds are effectively noticeboards announcing events or news? There is no interaction or engagement. building a group of followers who stand up for the organisation. If you have a social rather than broadcast approach to your comms and social media, when a crisis hits, you will be in a better place to respond. Partly because you’ll probably have a bigger audience but mostly because you will have an engaged one. Key to responding well is planning. Have you done a training exercise around a crisis situation? Have you brainstormed situations and standard responses? Even if these scenarios never occur, it is useful to have done the thinking so you can apply it to a different situation. your tone of voice and housestyle. How is this different on social media? How would your press statement work cut and pasted on to Twitter? Do you need to change the jargon or simplify the message? What images could you use? your integrated comms – how will you use different social channels? How will this integrate with your website, print and email comms? processes around publishing to social media, including monitoring and responding out of office hours. Do you have a list of who uses social media in a professional capacity to represent your organisation so you can get hold of them in an emergency? I have produced a set of questions to help you work out whether it is a good idea to respond or not – see Crisis Comms Questions (PDF). There are no right or wrong answers and not every question will be relevant. This is intended to help you think about the situation either as part of your crisis comms planning in ‘peacetime’ or if you are in a live crisis. In addition to well documented crisis, played out on social including Oxfam, GOSH, RNLI and Dogs Trust, here are some examples of hospice crisis comms in action. 91-year old Fred attends St Giles Hospice’s computer group. The team asked people to wish him happy birthday via their Twitter feed. It took off! To date there have been 45k retweets and 40k likes and thousands of people sent birthday messages. Fred was featured on local news and radio. The team worked out when to calm the situation down and regularly checked in with Fred that he was ok with the attention. Fred signed off the press release. 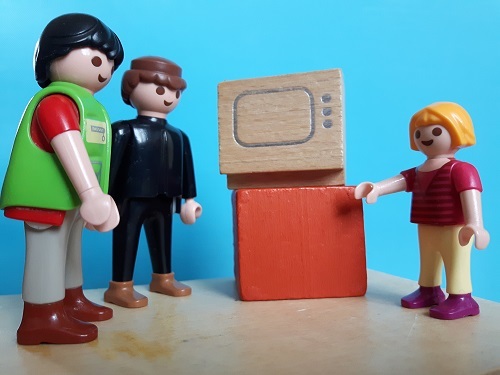 The coverage helped them to tell people about a different aspect of their work as Fred wasn’t a patient. When someone stole donations from the hospice last Christmas, the team wrote an open letter to the thief on their website and promoted it on the social channels. This inspired people to do something to help. Local people, businesses and community groups rallied round and gave donations. The story got on the local news. The hospice was overwhelmed by the response and over £5000 was raised. Thorpe Hall could have said nothing about the incident but by approaching it in a positive way, the story spread and inspired people to get involved with great results. Brathay Trust: a lesson in crisis comms – how small charity responded to a crisis earlier in the year. Is your social media response helping during a crisis? – blog post by Jon Ware about the importance of flexible messages. Some useful insights into the Oxfam crisis from the people who managed their comms in this IoF conference thread documented by Hugh Radojev. Crisis comms plan template – from Charity Comms. The Charity Social Media Toolkit – lots of tips and ideas for using social media well. Dealing with online harassment and negative comments – useful flowchart resource from Social Misfits Media / Lightful. See also 5 digital comms tips for hospices – a blog post from 2015 with some great examples. How has your organisation approached crisis comms? Are there situations where you purposefully haven’t used social media? How do you make decisions about what to do? Who decides? Please do share in the comments. I’d particularly like feedback on the PDF questions – are they useful / what’s missing? Get in touch if I can help you with digital copywriting, content planning, training or strategy. I work with charities of all shapes and sizes. Can I help give your comms or digital processes a healthcheck and ideas injection? With thanks to Sue Ryder, St Giles Hospice, St Wilfrid’s Hospice and St Ann’s Hospice who shared their experiences as part of research for the workshop / blog. So many huge things happened in June. The Manchester One Love concert raised £2m in three hours, dogs in polling stations had its own emoji thanks to Twitter and Dogs Trust, the awful events in Kensington and Finsbury Park and the wonderful Great Get Togethers. It was also a bumper month for good reads and interesting charity content. Here’s my round-up. What a digital organisation looks like by Janet Hughes from doteveryone is a really useful 10 minute read about the characteristics of a digital organisation and its leaders. Rewriting the rules for the digital age by Deloitte shows how organisations will change. Reassuringly, Dr Simon Davey from CassCCE says digital doesn’t have to be difficult and shares seven points to consider. Overcome resistance to change with two conversations (Harvard Business Review). CharityComms’ innovative organisation seminar slides from May plus follow-up blog post from Nick at Neo about changes to drive the innovative self which is well-worth a read. Rolling out a new CMS or database? Read how Citizens Advice are training 23,000 people to use their new software. Will digital fundraising destroy the charity sector asks Mandy Johnson citing the number of individual people setting up appeals. See also this BBC article ‘I raised £52,000 and wished I hadn’t‘. From here to there: getting ready for 2022 – top tips for future-proofing your comms by Sarah Fitzgerald. Five productivity tools every charity communicator needs to try by Matt Chittock on CharityComms. Audience analysis: are you talking to the right reader? by Good Copy, Bad Copy. Write-up about the new Crisis website I worked on recently. The National Archive’s digital strategy. A closer look at WWF’s social strategy on eConsultancy. Ross McCulloch shares his tips for developing a social media strategy. See also, do you really need that social media account from Comms2Point0. And fundraiser vs social media officer by Jon Ware. Shelter produced a short video looking at how house prices have increased since the first episode of Location, Location, Location in 2000. RightsInfo produced this brilliant video in which their volunteer Anirudh encourages people to vote. The Secret Life of Us is a campaign from a coalition of 45 charities raising awareness of the experience of families of disabled children. London Fire Brigade have been sharing their public information films including this one about how to deal with a flat / maisonette fire. Greenpeace used beautiful images of ice lollies which on closer inspection revealed a sinister story. For Small Charity Week I found some examples of brilliant small charities doing interesting fundraising. 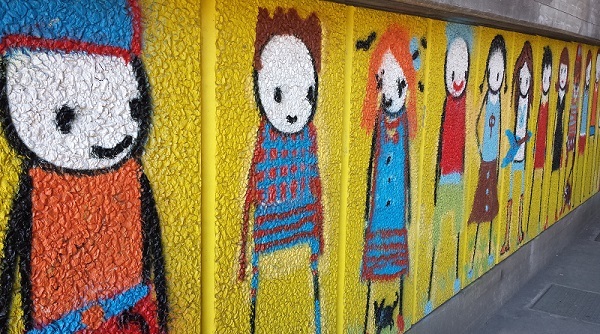 From wishlists to live crowdfunding, see five fundraising ideas for small charities. I have been enjoying videos and tweets from All The Stations as they continue their journeys around England and Wales and soon into Scotland. The Independent’s Happy List 2017 was packed with brilliant people doing brilliant things. One of the highlights of General Election night was Mr Fishfinger’s vote count. And this is useful advice about the size of fidget spinner you need if you have big stress. What did you read / write / enjoy this month? How digital is your organisation? A recent Guardian Voluntary Sector Network article by Zoe Amar argued that charity boards are failing to adapt to the digital age. And Karl Wilding argues on the NCVO blog that digital changes everything. Some organisations already have digital at their core. Just look at how Parkinson’s UK advertised for their new role of Director of Digital Transformation and Communications. Whereas many know they should be doing more but don’t know where to start and others just don’t see digital as a priority. Charles Handy at this week’s Cass CCE Charity Talk talked about the need for organisations to find their second curve to survive and in particular the impact of digital on this. He predicted that online platforms (such as Uber) will be central to the way we live our lives. Two free resources this week look really useful to help organisations understand where they are digitally and improve their skills. Share them with your boards / Senior Managers / colleagues. NCVO released a new free toolkit developed by Helen Ridgway. Building a digital workforce ‘includes templates, resources, tips and examples – and a series of bespoke workshops, training and support – to help you plan, design and deliver a comprehensive digital skills development programme for your organisation’. It is packed with 25+ documents including several about conducting a skills audit. Also on my radar this week is the Third Sector Digital Maturity Matrix developed by Breast Cancer Care. It was developed to ‘to assess the maturity of an organisation’s digital capability (i.e. the current state) and compare it to where they aspire to be (i.e. desired to-be state)’. Download it for free. Have you spotted any other useful resources? Or like NCVO and Breast Cancer Care, have you shared your own tools for other people to use? Please share in the comments below. I have found it hard to keep up with all the great blog posts, events and resources about digital strategy tasks, transformation and charity content in recent weeks. There has been so much! Here for your viewing pleasure is my pick of the crop. Many give useful tips on research methods used as part of digital or content strategy work. Great post on How people look for things on Citizen Advice’s super interesting and helpful blog. 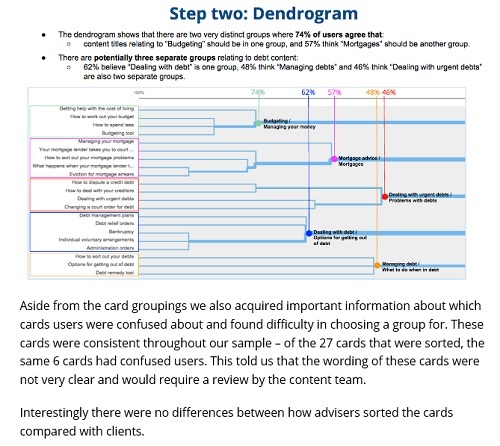 They did an open card sorting exercise with 54 clients and advisors. The post shows the analysis they did and explains that they got results they weren’t expecting. This will help them to build navigation which will make sense to their users. SIFT Digital recently did a digital transformation project with the Canal and River Trust. This case study shows some of the work they did including one of the personas they produced. 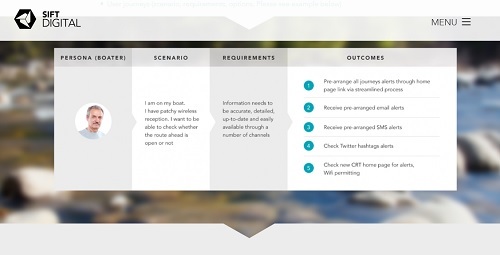 Their guide to Map your experience – helping to explain customer journeys is also worth a read. How to do a content audit in four easy steps – JustGiving. If you have ever done a content audit, you’ll know that it can be a long arduous process, especially if you have a large website or multiple sites. This post looks at how to do a user-focussed audit. This week I have mostly been designing a survey. It’s a long process to get right. This How to design and use free online surveys is a very thorough guide if you are just starting out. There’s also a guide on How to run a website satisfaction survey. The Right Attitude – free report on the nfpSynergy site by Trina Wallace and Sarah Myers on audience segmentation. Have you sorted out your organisation’s message architecture? No? Align all your messaging with this simple (and fun) tool. Need some benchmarking data on online use? Go to WeAreSocial’s Digital in 2016 research. If you missed this event, take a look at the presentations from the CharityComm’s digital communication trends for 2016 and beyond. Econsultancy profiled an innovative campaign by WaterAid – The smartest experiential and charity marketing campaign you’ll see this year. The Scouts’ new digital manifesto includes badge for coding. Not sure where to start with your own innovation? Read Lucy Gower’s post What should you innovate about?. How to craft content that people love – some useful nuggets in this post from BufferSocial. The Power of Okay – slick video from See Me Scotland. Guardian Voluntary’s campaign of the month (written by Kirsty Marrins) is Cancer Research’s Cancer is happening right now. This blog post I wrote for CharityComms on producing graphics on a budget also went live this week. Have you seen any other good reads this week? Please add them here in the comments box. I help charities and non-profits with their digital comms. Whether you are looking for training for the team, copywriting or input into your content or digital strategy, please get in touch. Do I need a content strategy? If you have any (or all) of these content problems, going through the process of developing a content strategy could help. A content strategy is a plan for the content (text, audio, video, images etc) produced across all your channels (web, social, email, print etc) by your organisation. A content strategy can formalise and give a framework to your content production. For many organisations, content is produced in a haphazard way leading to issues of quality, accuracy, tone of voice, engagement and volume. A strategy documents these weaknesses and identifies new working methods. The complexity and scope of your strategy depends on what you want it to do. It can be an aspirational strategy or a working / planning document or both. 1. Identify the problems you want your strategy to address. Write down a list of your content ‘issues’ (such as those above). 2. Gather data to assess the extent of the problem. Think about the data which you could use to evidence your thoughts from stage 1. Surveys, interviews, focus groups, statistics and benchmarking analysis will help to build up a picture of the effectiveness of your content. 3. Planning and goal setting. Analyse the data to build up a picture of your content. What is really working well or not? What trends does your benchmarking data show? Use this information to identify your priorities. 4. Implementation and launch. Getting internal buy-in for your strategy is crucial to its success. Presenting the strategy to trustees and staff can help develop a sense of ownership. If you are recommending big changes, it can be easier to push these alongside a process change which can’t be ignored (such as a new content management system, email tool or brand relaunch). Do I really need a content strategy? Going through the process of developing a strategy can be just as useful as having the official strategy. It forces to you stop and assess the way content is produced and used in your organisation. It makes you ask lots of questions and gather data to back-up your assumptions. Your research may in turn identify new areas you need to address. Producing an actual strategy gives you something official to shape your work. If it has been signed off by managers or trustees, it gives you an authority to say no. A good strategy will give you a framework to reach your goals. We are in the golden era of content. There are so many different ways of using content and so many channels to feed to ever sophisticated audiences. Recognising how to use your limited time and resources to maximum effect is vital. A content strategy can help you to do that. Still not convinced? Read how Anthony Nolan developed their Facebook content strategy. I run courses on content strategy (like this Content Strategy course at Media Trust in 2015) and work on strategy projects with organisations. I help charities to review their content and ask questions about key messages, channels and processes. I help them to work through issues of quality and volume and think about how to create a culture of content within their organisation. Please get in touch via Twitter or email if you would like to talk more. Happy birthday World Wide Web! 25 today! 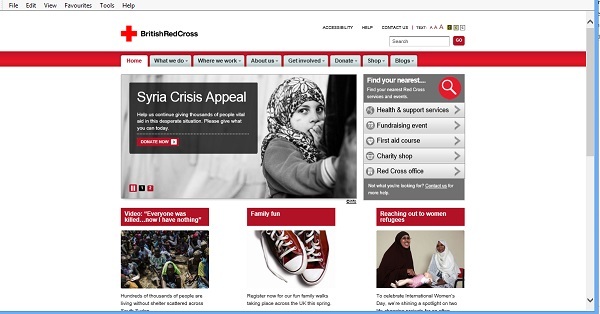 Using the brilliant Wayback Machine we can look at how charity websites have evolved. 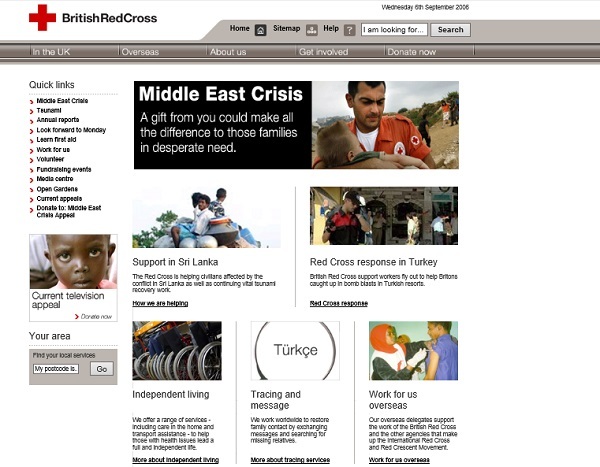 Using British Red Cross as an example, let’s see how charity websites have changed and what this means for the future. 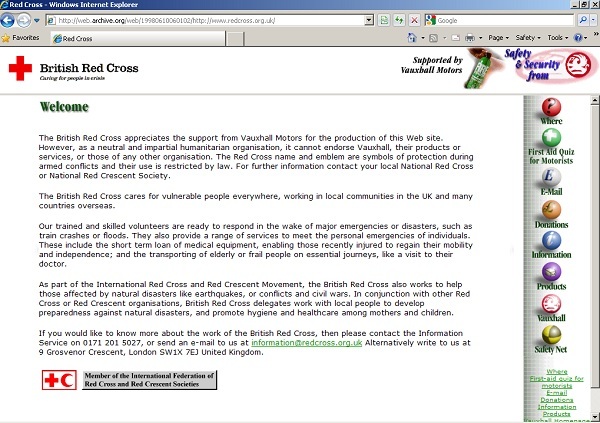 British Red Cross homepage in 1998 shows that the web standard of logo in top-left was there from the start. The site was probably hand-coded and uploaded via FTP. To make a donation, please email. Text-only homepage and children pages (only one level). Fast-forward eight years and the 2006 homepage leads with an appeal. Fundraising and raising awareness is now most important. There is greater awareness of design. More thought about actions and audience. Images but no coherent design. Site-wide (top) and left-hand navigation. Fundraising prominent – 6/12 ‘Quick Links’ are fundraising. Donate now tab. Functionality – ‘In my area’. No social media (Facebook launched in 2004, Twitter in 2006). Another eight years and now the current site still leads with an appeal but uses a single emotive image. The site is sophisticated offering many opportunities for interaction, transaction, discussion and commerce but also has a presence across many other digital platforms (YouTube, Facebook, Twitter, blog, Apps, games etc). Multiple channels (links to six network channels at the bottom of the page). Optimised for mobile / tablet. Greater use of video, audio, photos, games to tell a story. Donation button and quick paypal option on homepage. CMS powered, integration with CRM and other databases. Evolution of ‘in your area’ functionality. As websites and digital expectations become ever more sophisticated, having an organisational digital strategy is important. You don’t need to be the size of British Red Cross to need a clear plan for how your digital sites support the goals of your organisation. You may use a strategy to persuade trustees to invest in new technology or staff. You may use it to plan your increasing use of social media and have a reference for how you’ll deal with a crisis. Or it may help you plan the next 6-12 months, ensuring you are using your resources in the right way and keeping up with your peers. Whatever you use it for, it’s worth investing your time in producing a digital strategy so you are working at the 2014 stage, not 2006. Digital and social media will evolve again – don’t get left behind. And if you need in-person help, there are plenty of Digital Strategy courses and freelancers / consultants who can support you through the process. What was your website like in 1998? Never miss a post. To follow and receive new post notifications, please enter your email address.